Combine the chia seeds, oat milk and sugar in a bowl, cover and leave to absorb for approx. 30 mins. Mix the apples and lemon juice in a pan, add the sugar and ginger, cover and simmer for approx. 15 mins., stirring occasionally, mash with a fork. Transfer two-thirds of the apple sauce to the jars. Add the rhubarb and sugar to the remainder of the sauce, cover and simmer for approx. 15 mins., stirring occasionally, allow to cool slightly, puree and leave to cool completely. Mix the chia pudding thoroughly once again, spread on top of the apple sauce, cover and chill for at least 2 hrs. Just before serving, top with the rhubarb and apple puree. 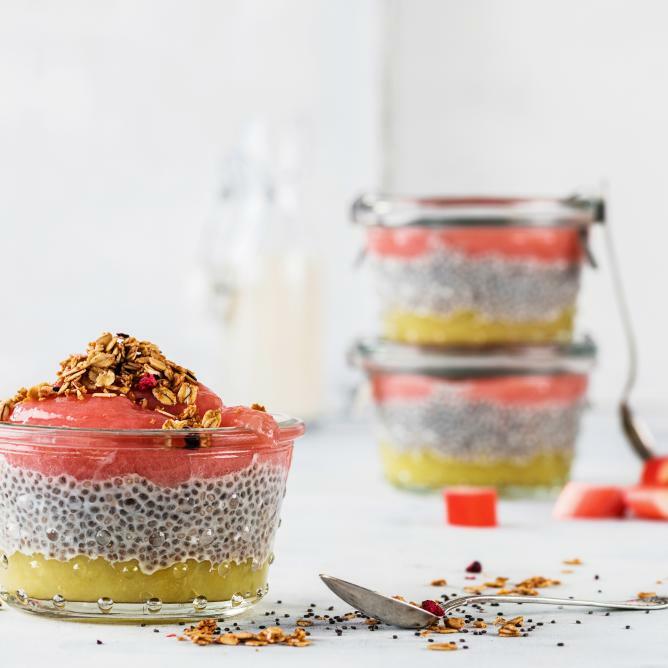 Prepare the chia pudding one day in advance.